Imparting an out of the world meal experience requires a lot of preparation beforehand. Food and beverage businesses work to bring out the best possible experience for their guests and customers to achieve maximum customer satisfaction. All operations regarding food and beverage service need preparations by anticipating guest arrival at any time during working hours. Let us see what all basic preparations are required to be done. It is the activity of preparing the environment in the F&B Services establishment so that the guests and the service staff find it hygienic and pleasant. Opening all windows and doors before working hours to let fresh air and sunlight enter the venue. Ensuring menu cards and promotional material are presentable. Removing the furniture that needs servicing and handing it over to the maintenance department or any outsourced agency. Switching on all lamps to check the fused ones. Removing all soiled linen and replacing them with the fresh ones. Ensuring that the side board is well-equipped. Replenishing condiment containers, shakers, and water jugs. Replacing pale flowers with the fresh ones. 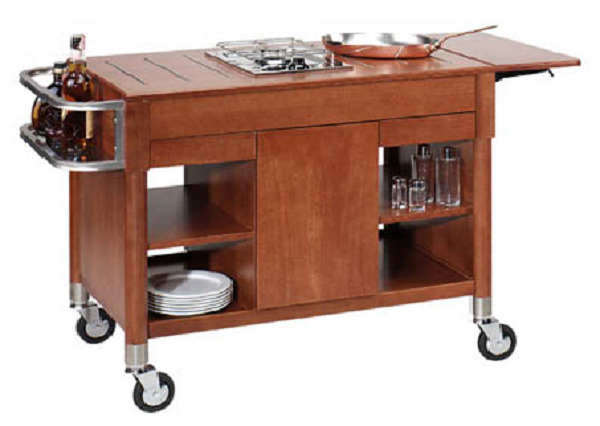 It is a piece of furniture with numerous compartments and shelves to keep condiments, water jug or bottles, cutlery, food platters, and linens. Side boards are allocated for every station. The replenished containers of water, butter, and condiments. The dinner plates, side plates, glasses, mugs, and fingerbowls in the lower shelves. The linen, napkins, and dolly papers neatly and stalked. The cutlery in the appropriate sections separately according to the type. The condiments containers and shakers, water jug, butter dish, toothpick holders, straw holders, on the upper shelf or board. Ice and water are the preliminary requirements of any food and beverage service establishment. Clean drinkable water is obtained from the water purifiers installed in the service establishment. The purifiers are selected such that they can cater to large number of people per hour. Crystal clear ice in the shape of large cubes can be prepared in-house if the size of F&B establishment is large enough to install the required equipment. The ice can also be purchased from an outsourced ice-making business and stored in the freezers. When the guests are seated, they are first served water at adequate temperature according to the season.